Filter Magazine presents a special advance screening of the comedy Hamlet 2 as part of their Flicker Film Series at the Arclight Cinemas. Written by South Park scribes Pam Brady and Andrew Fleming (who also directed), the film stars Steve Coogan, David Arquette, Catherine Keener and Elizabeth Shue. 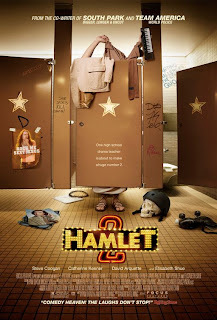 Hamlet 2 premiered as a late addition at the Sundance Film Festival and sparked an all-night bidding war for the distribution rights. Eventually Focus Features acquired worldwide rights for $10 million--almost tying the Sundance record set by Little Miss Sunshine, which sold for $10.5 in 2006. A confirmation e-mail will be sent, but confirmation does NOT guarantee admittance so arrive EARLY!! !